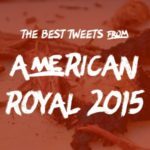 The Best Tweets from American Royal 2015 & a Giveaway! American Royal time is our favorite time of the year, and to help celebrate, we’re giving away an awesome new Smoker! Come by #F113 or go to our website and enter for a chance to win a brand new Good-One Patio Jr Smoker! Catch the best of the American Royal by hearing it directly from attendees’ mouths! Lick the BBQ off your fingers and send your favorite tweets or Instagram posts to us @BBQspot. Be sure to stop back often to see more of our favorite tweets from American Royal 2015 (we’ll be adding them to the top of the list). Our #BBQ specialists will be updating it all weekend! American Royal: 618 BBQ teams competing. KC BBQ Society: 15,000 members, largest in the world. Any other doubts that #KC BBQ is the best? Discovering you’re wearing your shirt inside out and not caring. Welcome to day two at the American Royal.